Involvement with the CPA exposes your company to potential customers who are looking for your unique contract packaging and manufacturing abilities. People look to the CPA for answers to their contract packaging and manufacturing needs. Contract Packaging Magazine, published three times per year, provides poignant insight on issues and news in the contract packaging industry. The CPA's Request for Quote allows anyone needing a contract packager the opportunity to request information about a member company’s services, including packaging capabilities and service costs. State of the Contract Packaging Industry Report Now Available! 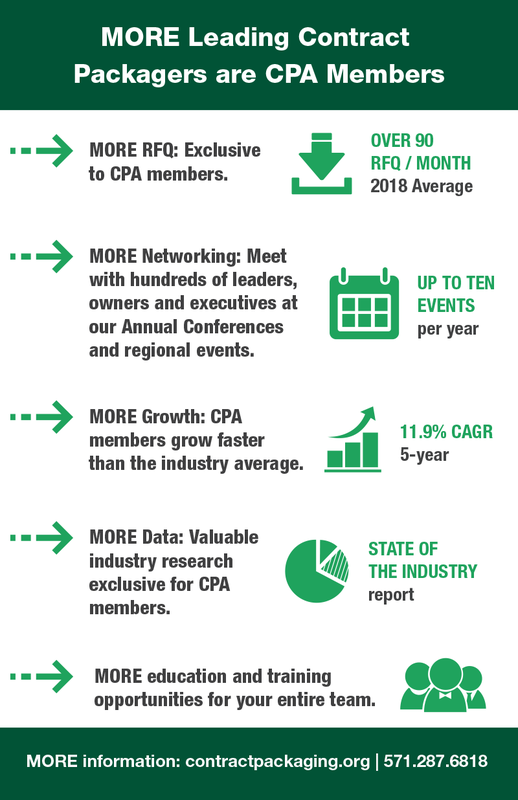 The CPA State of the Industry Report provides deeper industry insight, increased market intelligence and conclusive future trend analysis. This report is valuable to contract packagers, contract manufacturers, private equity investors, industry suppliers. and customers. High Pressure Processing (HPP) is the leading non-thermal technology in use today to extend shelf-life in a variety of food and beverage applications. Join CPA, The Association for Contract Packagers and Manufacturers, and the Cold Pressure Council who are co-sponsoring this informative and topical session. Apply for Our Scholarships – Deadline Approaching! CPA, The Association for Contract Packagers and Manufacturers, is proud to offer two scholarship programs – The Thomas Bacon Memorial Scholarship and The CPA Technical Scholarship. Join us today and experience the impact CPA will make on your business! Your best bet for a competitive advantage. Already a member? Consider volunteering!